Good Morning Crafty peeps, hope your Thursday is off to a great start. Mine started on the right track, I have my cup of Starbucks and I am rocking and rolling. 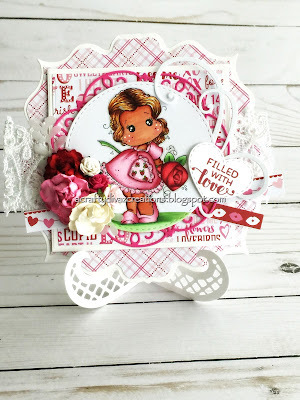 I have a inspirational post for you today using the cute Honey Sweet Heart from Scrapper's Delight which you can pick right now in the shop for $1.50. This is a digi-image, so I printed her out on copic x-press it blend card stock. I colored her with copics and cut her out using my brother scan and cut 2. 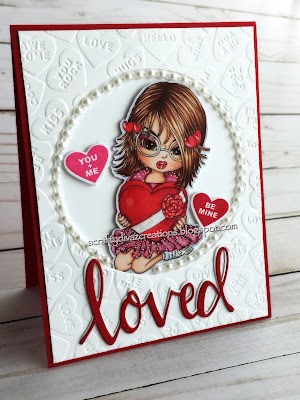 I created a A2 card and used the hearts conversation embossing folder by Taylored Expressions. I die cut a circle in the middle and added the image. I added the die cut word Loved which is also from Taylored Expressions to the bottom of the card. I then added die cut conversation hearts around the image. I decided at the last minute to add the pearls around her and love the way this card turned out. Check out the Scrapper's Delight Store and definitely pick up this cutie and any other images. Thanks for stopping by, talk with you soon. Have a Fabulous Thursday! Good Morning Crafty Peeps, hope your Wednesday is off to a great start. Over the weekend I received my stamp box from Magnolia. I was totally surprised and excited all in one. I immediately mounted the stamps so I could color them up. I love this stamp box, all the stamps are super cute. I have a card to share with you today using one of those cute images. I created a gatefold card with this image. I used designer papers from a paper stack I purchased from my locate craft store. I added the lacy heart border from La La Land Crafts to the stop of the card. I I stamped the image with MFT hybrid black licorice ink on copic x-press it blend card stock. I colored this cutie with my copics and cut her out using the stackable circle die from Lawn Fawn. I added the pierced scalloped circle die from La La Land Crafts and behind that the stitched fancy scalloped circle die from Kat Scrappiness. That's all I have for you today, thanks for stopping by. Hope you have a great rest of the day. We will chat soon, have a happy crafty day. Hello Crafty Friends, hope you had a great weekend and was able to get some crafty time in. I have another guest design team project for Crafty Sentiments Designs. This week we are creating projects using our dies. I created a pop up card using the cute Patsy Little Ladybug stamp. I used my copics to color up this cutie. I added designer papers from Carta Bella called Amour to my project. I used dies from La La Land Crafts and Lawn Fawn. 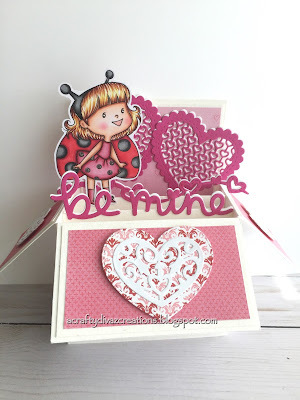 Make sure you check out the Crafty Sentiments Designs challenge blog and join in on the fun. Thanks for stopping by, chat with you next time. Have a fabulous crafty day! Hello my friends, Happy Friday!!! The weekend is almost here and its time to get crafty. 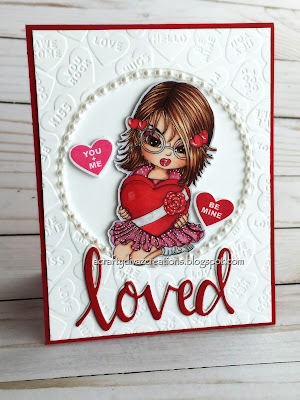 Today I am over on the Papernest Dolls blog sharing a card using the new Love Struck Emma from Papernest Dolls. 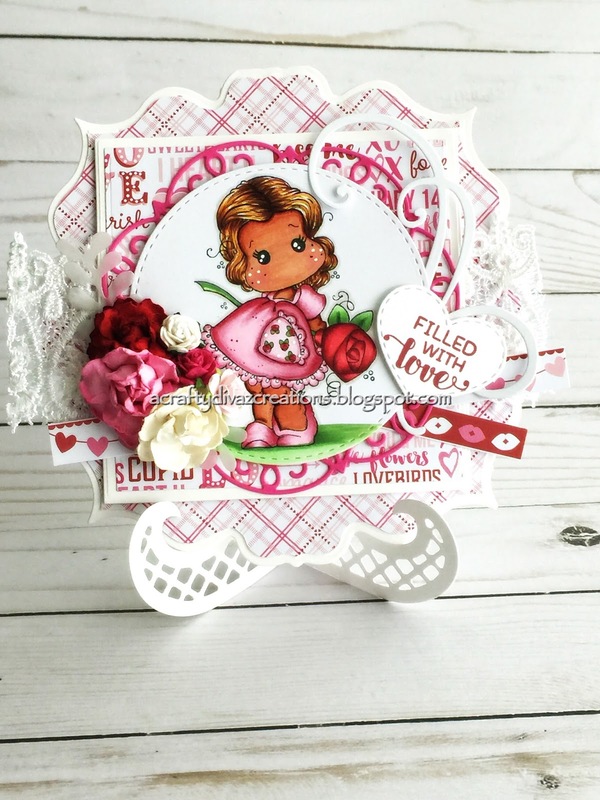 I love creating projects for Valentines and Love Struck Emma was released in the shop at the perfect time. I have a lot of valentines paper that I accumulated over the years and decided to pull some of it out to create this card. I colored love struck emma using copics with the colors listed below. I die cut two stitched hearts and added them to the card. I found a burlap heart in my stash and thought it would be perfect for this card. I added some flowers from wild orchid crafts and the sentiment is from some die cuts I had in my stash. Hope you like this card and it provides some crafty inspiration for you. Check out the Papernest Dolls store and pick up Love Struck Emma. Thanks for stopping by and have a fabulous crafty weekend. Hello my friends, Happy Monday. Hope you had a good weekend and was able to get some crafting done. The weekends seem to go by so fast, I just need one more day to rest. Who am I kidding..... I need one more day to craft. 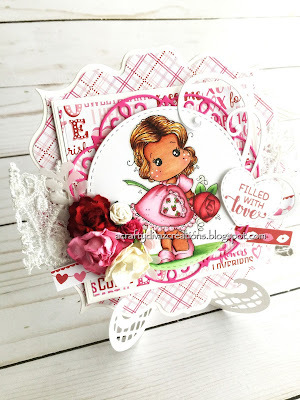 I have a card to share with you today using Magnolia Tilda with Big Rose. 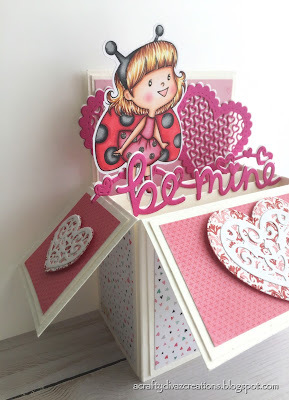 I just love creating with these stamps, they are super cute. Valentines will be here before we know it so I wanted to create a valentine's card using this cutie. I cut the card base out using the die from Magnolia Vintage Box 1. The paper I used is a paper stack I recently picked up at my local craft store. Behind the image, I added a doily that I cut out using a prima doily die. 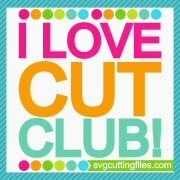 The image was cut out using the la la land crafts stitched circles die. I layered a magnolia die behind the image along with some lace I found in my stash. 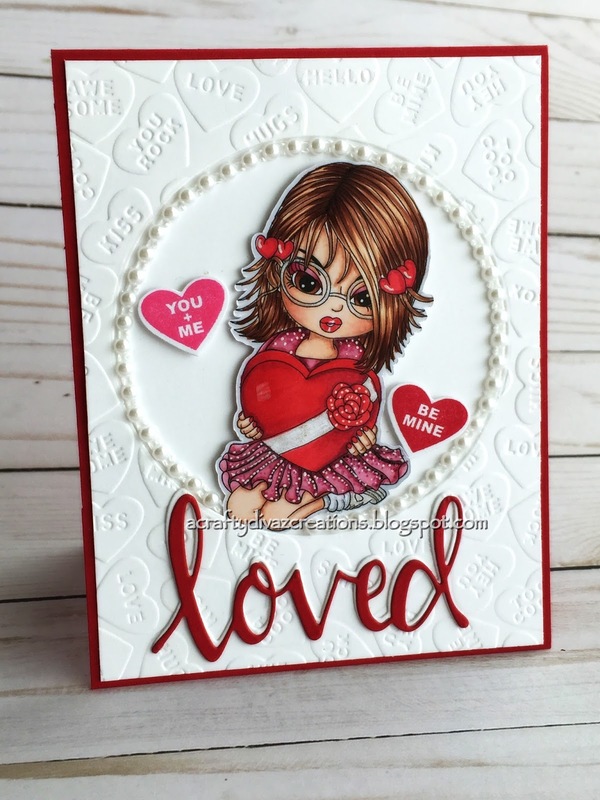 I added a stitched heart from La La Land Crafts to the card with a sentiment from Taylored Expressions stamp set. Hope you like the card and it provides you with some crafty inspiration. Leave a comment below and let me know what you think. Thanks for stopping by and have a Fabulous MONDAY. Happy Sunday Friends, thanks for stopping by. I have a card share using one of the images from the new release Love Letter Avery. There are two versions of this cutie in the store. Love Letter Avery comes with the polka dots or stripes on her dress. I love the polka dots on her dress. 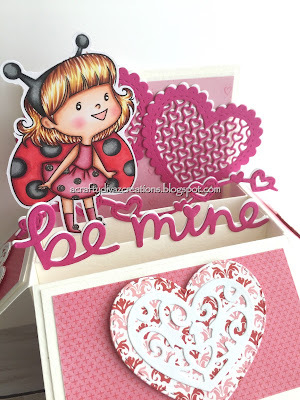 I am gearing up for Valentines and this cutie is a perfect image to create some Valentines projects. I printed the image out on copic x-press it blend card stock and colored her using my copics. Since she is holding a love letter, I decided to add a mailbox to the card. Ms. Avery is sending her letter to her valentines💖. I love the way this card turned out and the recipient will love it too. Check out the Papernest Dolls store for the new release. You will love all of the cute images. Thanks for stopping by, see you next time. Hi friends, it's Thrifty Thursday over at Scrapper's Delights. I'm here to share a card using the Lilly pad and Ballet Fairy. You can pick up both images for a great price. Check out the store, you will find some great deals this month. I wanted to create a scene where she was floating on the water. I decided to use watercolor pencils I had in my stash and created the water. This was my first time doing this and I actually loved the way it turned out. Sometimes you just have to step outside of your comfort zone and just do it. I colored the fairy and lilly pad using my copics. My favorite color is purple so I had to make this card using my favorite color. I die-cut the image out using the wonky stitched squares from MFT. The frame of the card is cut out using my spellbinders dies. I die cut the happy word from La La Land Crafts and added it to the side of the image. I love the way this card turned out! If you are interested in this and other Scrapper's Delights images definitely check out the store for all of the great deals this month. While you at it, join on us over on our Facebook group as well. Thanks for stopping by, Have a Happy Crafty Thursday. Good Morning Crafty friends, thanks for stopping by. I was asked to join the Crafty Sentiments Designs as a guest designer and I am over the moon excited. Thanks to Celine for inviting me to participate with the team. 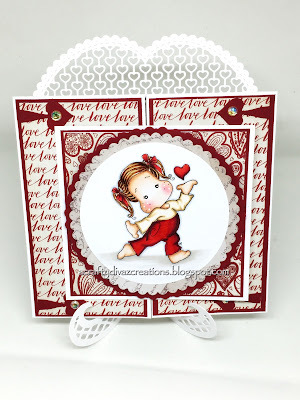 For this week's challenge over on the Crafty Sentiments Challenge Blog, its "ANYTHING GOES". I decided to use the super cute Faith-Play with Music for my card. I used lawn fawn hello sunshine designer papers for this card. I wanted Faith to be the focal point so I die cut her out using a stitched circle die and added a stitched scallop die cut behind it. 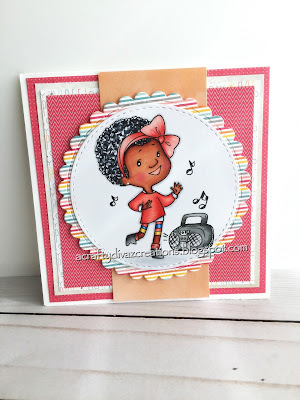 I stamped her out on press-it blend card stock and colored her using my copics. Oh yeah she is definitely rocking her music for sure. Make sure you check out the other ladies creations over on the blog and take part in the challenge. Thanks for stopping by and have a happy crafty day. Happy New Year everyone! Hope you are having a great start to 2017. 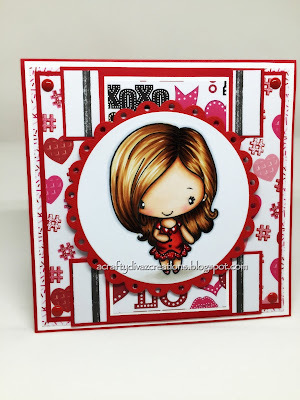 I am super excited to be a guest designer for the month of January for Kraftin Kimmie Stamps. So without further ado, let get this party started. Today is Day One of the first release of 2017 over at Kraftin Kimmie Stamps! Today we're kickin' things off with a a very appropriate set of ADORABLE animal stamps by artist Cheryl Grant! This sweet new features a large main image of some sweet animals getting ready to celebrate! 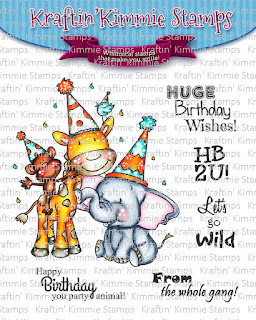 It also features FIVE awesome sentiments in a mixture of fun and funky fonts! 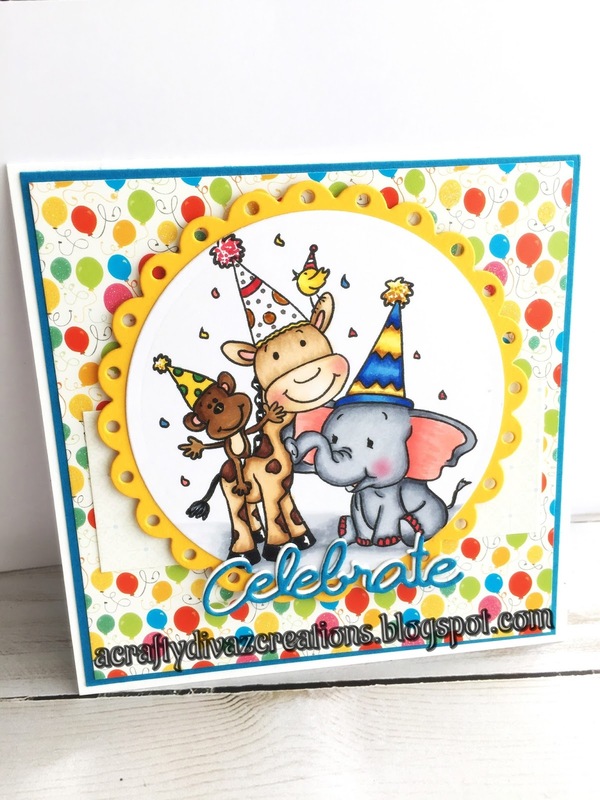 I decided to create a card for my niece birthday so the party animals set was perfect. I used the Birthday Wishes stack by DCWV for this card which made those cute animals pop. It's party time for sure. 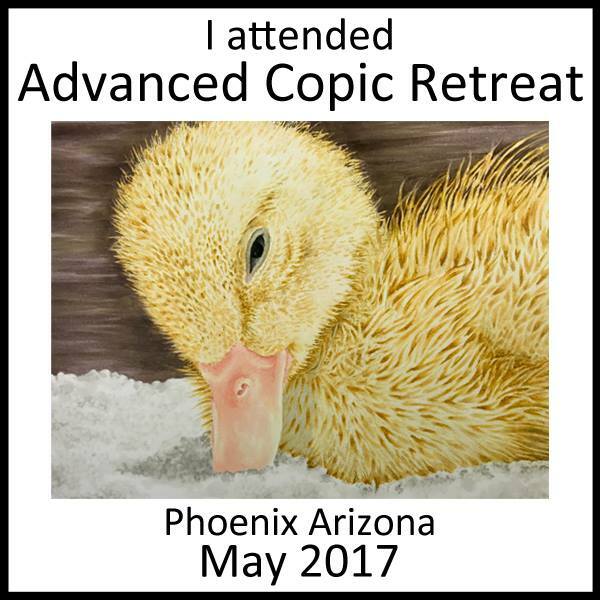 I wanted to focus on the cute animals so I decided to die cut the image out using a scalloped and circle die. I colored up the image using copics, colors listed below. I die cut the word celebrate in white and blue card stock. Be sure to join us at the LIVE Online Release Party on Saturday afternoon at 1pm EST! We'll be checking out ALL of the SIX new clear stamp sets, sharing fabulous creations, giving away prizes and having tons of krafty fun! Click below to check out all of the Krafty Krew design team members along with some special guests have lots of WILD creations to share with you today featuring the PARTY ANIMALS stamp set! Be sure to hop around and leave lots of love at each and every stop because one lucky commenter will WIN a gift voucher to the krafty shop! The winner will be announced at the party so don't miss it!I have a card share for you today.